Make sure that you drain and clean off your pool cover before removing it. Spring is around the corner and you know what that means. That’s right, it’s time to re-open your pool for the season. Though the weather in Maryland isn’t quite warm enough yet, it is going to come before we know it. You can’t just take the cover off and hop back into the water after months of not using it. Here is what you need to do to re-open your pool this season. The first step to re-open your pool is to take the cover off. 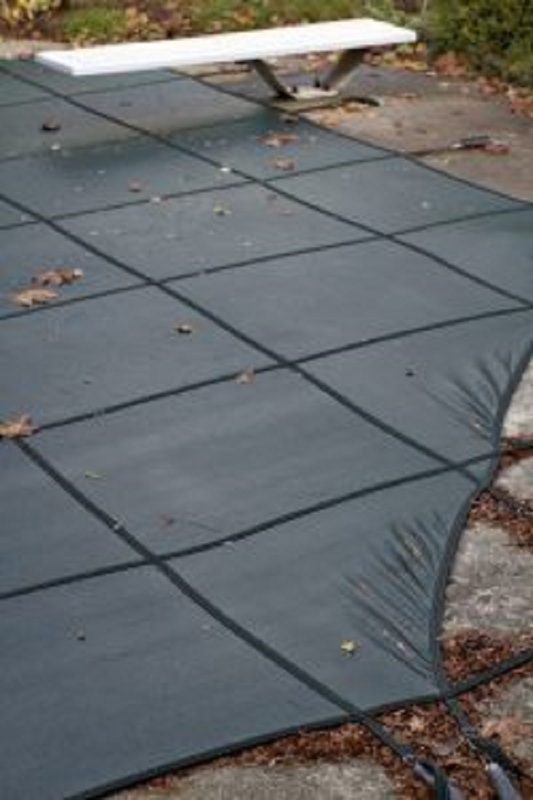 If you have a winter cover on your pool to keep it protected, you want to drain all the water from it. You can do this by investing in a cover pump that will drain the water for you. 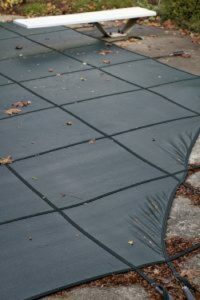 You want to clean off any excess debris and leaves that you see on the pool cover before you remove it. When you do remove it, some excess debris is bound to get in your pool. That is perfectly fine because you are going to treat the water anyway. If you prepared your pool for the winter time, that means you unhooked all of the pool equipment. After filling the water back up to its normal level, you want to reconnect all of your filters, pumps, heaters, and any other pool equipment you may have. After you reconnect it, you want to turn everything on to get your pool started. After letting your pool equipment run for a few hours, you want to test the chemicals in your pool. You are testing the water for pH, alkalinity, and Chlorine. After testing the chemicals, you want to adjust them as needed. You can not safely re-open your pool to swim if you haven’t made sure that the chemicals are properly leveled. After using your equipment to clean your pool, there will likely be some leftover dirt and debris. You want to skim the surface of your pool with a net to remove anything floating. After that, take a pool vacuum and clean the bottom. You can use a brush to clean off the sides. You then want to use a shock treatment for your pool’s water, which gets rid of all the bacteria in the water. This releases a large amount of chlorine into your pool so make sure you wait a couple of days before swimming. Once you have completed all of these steps, you can re-open your pool for the season! Ready For Your New Pool? Paradise Pools Can Help! Whether you want to upgrade your swimming pool or get a new beautifully-installed pool in your yard, Paradise Pools can complete the job. We have the expertise to walk you through every step of the process and ensure that you end up with a pool you can’t wait to take a dip in. Ready to get started designing the perfect pool for your home? Trust us with the job and be swimming in no time! We serve areas in Maryland like Baltimore County, Charles County, Howard County, and more! For more information, contact us online or give us a call at (301) 725-0005. To get more fun pool design ideas, follow us on Facebook, Twitter, Pinterest, Google+, and Houzz. This entry was posted on Friday, March 16th, 2018 at 9:22 am. Both comments and pings are currently closed.